Layered rock formations rise like islands in an ocean of fog at… – Sig Nordal, Jr.
February 21, 2018 February 21, 2018 Sig Nordal, Jr.
Layered rock formations rise like islands in an ocean of fog at Badlands National Park in South Dakota. 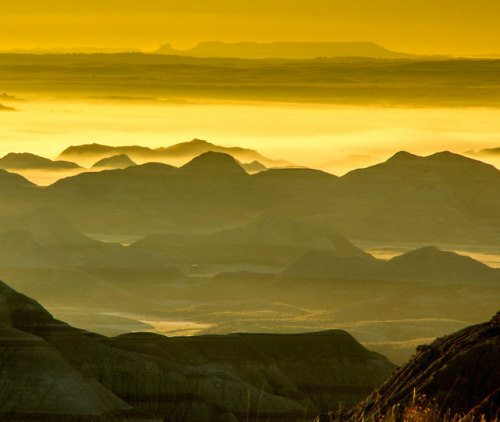 From golden sunrises to star-filled nights, Badlands offers terrific chances to explore ancient fossil beds, observe a variety of wildlife and learn about the park’s fascinating cultural history. Young visitors, don’t forget to get your Junior Ranger badge! Photo by Barry Castetter (www.sharetheexperience.org).